If you’re a marketer or publisher who creates new content on a regular basis, then dark social is a concept that you can no longer ignore. Dark social is traffic that comes from sources such as Facebook Messenger, WhatsApp, and email. Being able to measure traffic from dark social channels can help you get deeper insights into the performance of your content. But here’s the catch: links shared via dark social are difficult to track. In this article, we’ll explain what dark social is, its increasing influence on content sharing and web traffic, and finally, reveal a simple method in which to track website traffic from the most common dark social sources. The term ‘dark social’ was first used by Alexis Madrigal in an article for the The Atlantic back in 2012. In simple terms, it refers to traffic generated via private channels such as messaging apps and emails. In other words, dark social is any web traffic that’s not attributed to a known source, such as a Google search or a social media channel. It’s important to differentiate dark social from referral traffic as referral traffic sources are usually identified by certain tags attached to the link. Because the message is shared via private channels, dark social is difficult to track as compared to content shared on public platforms like Facebook and Twitter. This is the main reason why marketers underestimate the importance of dark social. But why is it so important to track dark social traffic for marketers? The number of people who are sharing your links via messaging apps is too insignificant to analyze, right? Not exactly. For one thing, it’s important to your marketing strategy because, as reported by Business Insider, messaging apps have more active users than social networking apps. 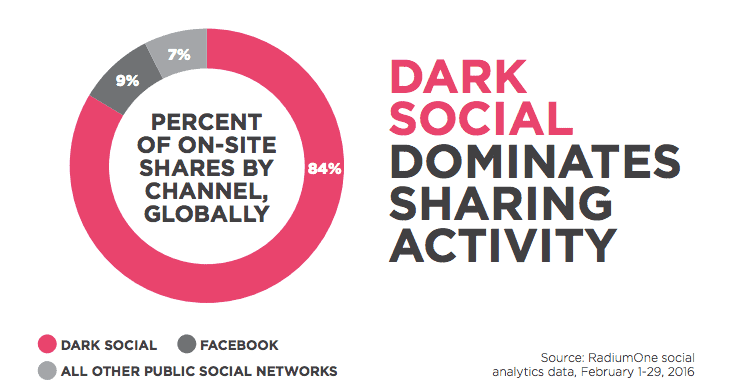 And secondly, dark social channels are dominating content sharing online, as revealed in the research report published by marketing firm RadiumOne. This research was conducted with an aim to help marketers and agencies harness dark social data and improve the return on their digital marketing investment. Here are 3 key insights from the report that make a compelling case as to why marketers need to take dark social seriously. The more engaging your content is, the more it’ll get shared on social media channels. As the social velocity of your post increases, so does the potential of dark social traffic. According to RadiumOne’s research, in the last few years, shares that happen over dark social channels jumped from 69% to 84% globally. If you want to engage your audience, you can’t ignore dark social because it’s where your existing as well as future users are. For the last two years, a majority of traffic generated from dark social has come via mobile devices. 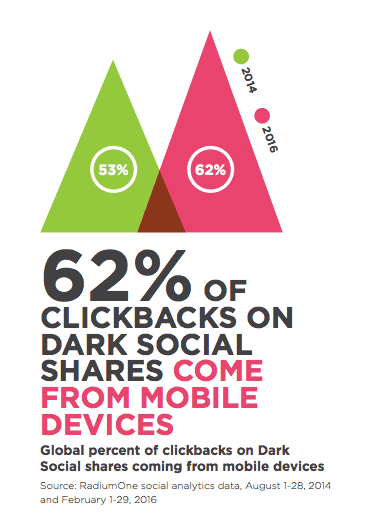 The research conducted by RadiumOne revealed that 62% of dark social shares came from mobile devices. This data suggests marketers and publishers need to assume that when someone shares their content, it’ll mostly be viewed on a mobile device. Web analytics tools such as Google Analytics track referral data to study your web traffic. Any link that gets shared and brings a visitor to your webpage carries a metadata. 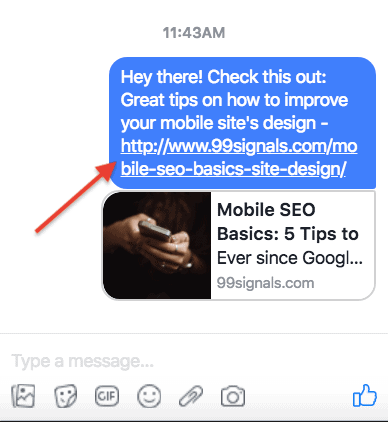 If a user shares a link to your website by copying and pasting it into Facebook Messenger or WhatsApp, the link carries no metadata. In this scenario, if the user’s friends visit your webpage, it would seem as though they typed the URL into their browser bar and landed there directly. As a result, measuring traffic from dark social is difficult, but not impossible. As you’ll learn in the next section, a few simple tweaks in Google Analytics will allow you to track dark social traffic. Now that you know the importance of dark social, let’s examine some of the ways you can measure traffic from dark social. While it is difficult to track dark social traffic, there are tools that can help you measure the impact of dark social on your site’s traffic. The most common and perhaps, the most easily accessible tool is, of course, Google Analytics. Since you may already be using Google Analytics to track different metrics on your site, it just takes an additional setup to start tracking dark social traffic as well. From your Google Analytics dashboard, go to Audience -> Overview and click on +Add Segment option on the right. 2. From the list of options, select Direct Traffic. Scroll down and click Apply. 3. 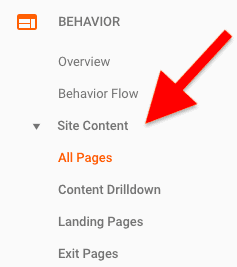 Next, go to Behavior -> Site Content -> All Pages. The result will show a list of all the pages on your site accessed via direct traffic. 4. Next, click the Advanced link on the right to create a new filter. From the drop-down list, change Include to Exclude and select Page as the dimension. Then in the field at the end of the row, type in the directory of one of your easy-to-remember URLs (for example, “/blog/”, “/contact/”, “/about/”). Add as many webpages as you can. Once you apply the filter, you should see a list of URLs which aren’t so easy to remember, and quite possibly, carry no referral data with them. These URLs are most likely the results of dark social traffic to your website. Dark social activity is too big to ignore. By tracking dark social data, you can have a deeper understanding of how your content is performing. Hope we were able to shed some light on the concept of dark social. What do you think is the impact of dark social on your web traffic? Let us know in the comments section.